Queen Victoria Cruises NET is unofficial fan website about Cunard Queen Victoria cruise ship – the smallest of the Cunard’s three “Queens” cruise ships. Our QV cruise ship review is integrated with the Queen Victoria cruise ship deck plans (all facilities and accommodations location by deck). 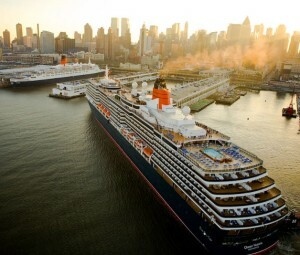 Ordered by Carnival and built in 2007 for the Cunard Line, Queen Victoria cruise ship is the second Cunard liner (by year built) and part of the most famous of the most famous ocean liners of the world fleet – right after the RMS Queen Mary 2 (flagship) and its sister (by design) the MS Queen Elizabeth. You don’t have to be a royalty to enjoy the Cunard Queen Victoria cruise ship – Cunard prices are your best guarantee about that. Just like her two sisters in the small large fleet, Cunard Queen Victoria signifies a high-class glamour featuring a classical elegance of a modern design cruise ship perfectly combined with the Cunard White Star service. On 11 December 2007, the ship’s Maiden Voyage from her home port of Southampton took place, taking in 10-day Northern Europe’s Christmas Markets cruise itinerary. Tickets for the voyage were sold out in April 2006 within 24 hours. 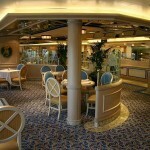 This was followed by Canary Islands short cruise, with the first 107-days World Cruise. During the first part of her Maiden Round The World tour, MS Queen Victoria also made first Transatlantic crossing. The Southampton to New York crossing was made with Queen Elizabeth II, culminating with meeting of the three Queen vessels. On January 13, 2008, the NYC’s most famous signature – the Statue of Liberty, became a focal point where all the three Cunard Queens met for the first (but not last) time – the huge RMS Queen Mary 2, the new Queen Victoria liner and the old Queen Elizabeth 2 ship. 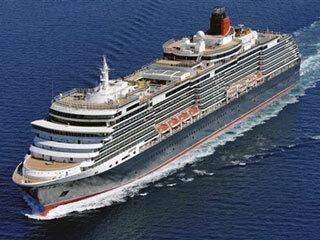 The Cunard three Queens met on April 22, 2008, merging their sail dates again – this time in Southampton. And for the QE2 ship this was the “sad but true” goodbye – she was retired from service in late 2008 with plans to be operated as a floating hotel. Maureen Ryan was selected as QV Godmother because she had been serving on all Cunard Queen four vessels. The ceremony also included a gold sovereign with the head of Queen Victoria and a euro placed under main radar mast. After being built, on 10 December 2008 the ship was Christened/named by a Royal Family’s member – HRH Camilla, the Duchess of Cornwell. MS Queen Victoria is UK-registered Cunard ship. She doesn’t hold the RMS designation as some of the vessels of Cunard Line, signifying they carry the Royal mail. MS Queen Victoria follows the tradition to name larger ships after the British Queens as with both RMS Queen Marys and RMS Queen Elizabeth II. She is second largest ship of Cunard ever built next to QM2. 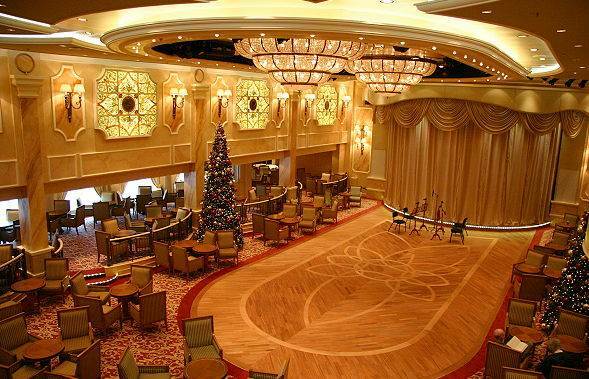 The Queen Victoria cruise ship’s weight is 90,000 ton, her building cost was £270m. QV is the first Cunarder built in Italy – constructed by Fincantieri in the Maghera yard (near Venice). In May 2006 the first section of her keel was put into place. Six blocks, each made up of 325t sections, completed with interior structure, ducts and cabling in modular fashion. Eighty sections of these were used. In January 2007 the ship was floated out. MS Queen Victoria’s dimensions are: length is 294 m (965 ft), beam/width is 41 m (135 ft) above waterline and 36.6 m (120 ft) at the furthest extent of bridge wings. Draft is 8 m (26 ft), height from keel to funnel – 62.5 m (205 ft). 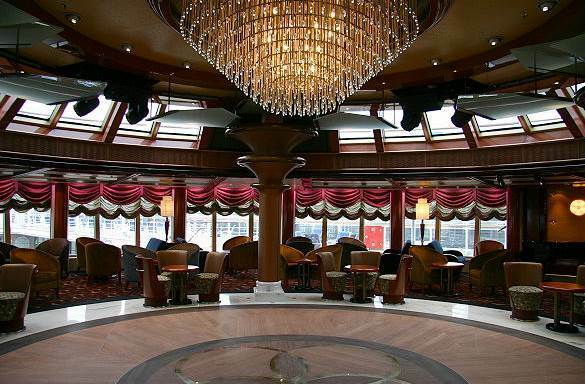 QV features hybrid design between Carnival Spirit-class and Holland America Vista-class ships. She has 2,014 passenger capacity and 1,001 crew, creating ratio passenger-to-crew of 2:1. 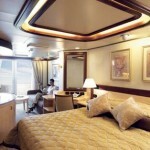 86% of the staterooms are outside, 71% offer private balconies. 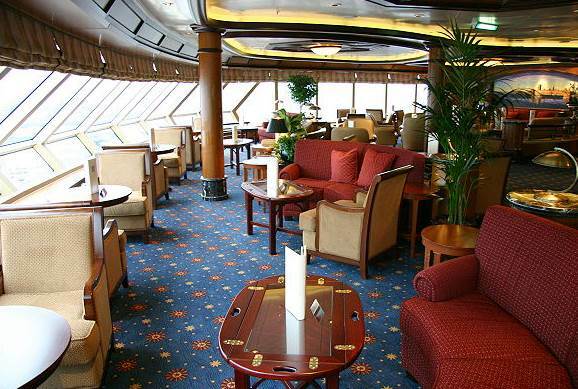 The open deck space is 10,000ft2. 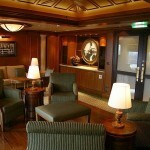 Namely her smaller size helps passing through Panama Canal, and offer greater itineraries’ variety. 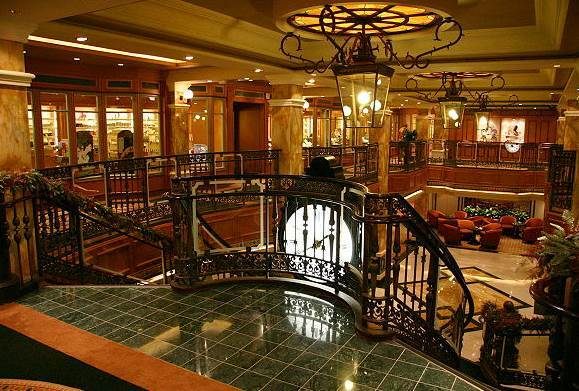 Despite her Italian exterior (being built at Fincantieri shipyard), QV’s interior decor reflects the British heritage of the operator Cunard Line. The power for the ms Queen Victoria power is provided by 6 diesel engines, including two 12 cylinder engines (12V/38A) and four 16 cylinder engines (16V46CR model) – total power output of all 6 engines is 63.400 kW. The diesel engines are fabricated by Wartsila (Sulzer ZA40 model – each cylinder’s bore is 400 mm, piston stroke 560 mm). The Finish Wartsila corporation also delivered the QV’s desalination plant (three Serck Como MSFs/Multi Stage Flash evaporators – combined capacity of 1,050 m3/day) and the MBR/Membrane BioReactor system for handling the wastewater (“MBR Hamworthy”, with two MBR320 T3 units, each with max capacity of 320 m3 black/grey water a day). Queen Victoria’s propulsion units are 2 podded drive propulsors, manufactured in Finland by ABB, each of the pods distributing up to 17.600 kW power (each fitted with fixed pitch propeller). There are also three bow thrusters with max 2.200 kW power. QV is also equipped with two folding fin stabilisers (below the waterline, positioned in the hull), with 20 m2 area each. The vessel features 3 power anchors (each weights ~11t, length is ~390 m; 2 anchors on each side of the ship’s bow, 3rd is spare – positioned on the crew deck). Heating sources on the QV ships are (used separately or combined) engine jacket water or generated steam. Her MSF evaporators capacity is between 100 and 1,000 t/day (at sea water temperature 2-32C / 36-90F). 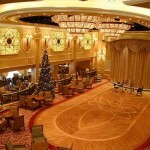 Cunard Queen Victoria deck plans (all staterooms and facilities location and information). And this is the QV page at the Cunard’s website. The cruise ship Queen Victoria offers exotic and high-class luxury voyages at affordable prices to the world’s most popular travel regions. And just like her 2 “royalty” sisters Mary 2 and Elizabeth – she’s a glorious queen, a “very much Cunard” liner, an exceptional cruising vacation choice. 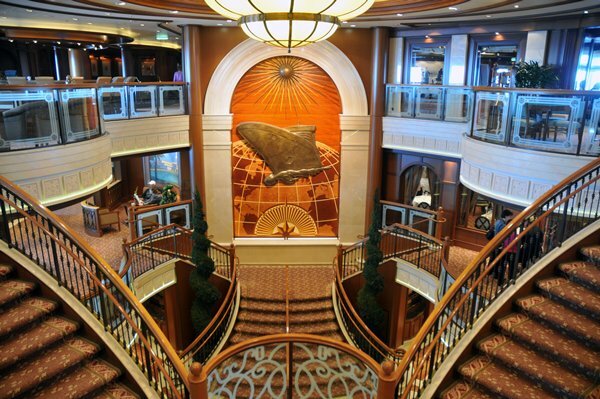 Queen Victoria is the 2nd largest liner of Cunard with 2,014 passenger capacity over 12 decks. 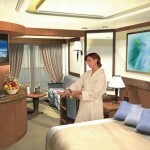 She features more than 1,000 staterooms, of which 86% outside cabins, and many with private balconies. 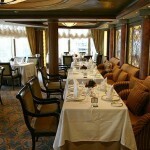 Upholding the tradition in classic cruising, guests’ accommodation choice is matched to the dining style. 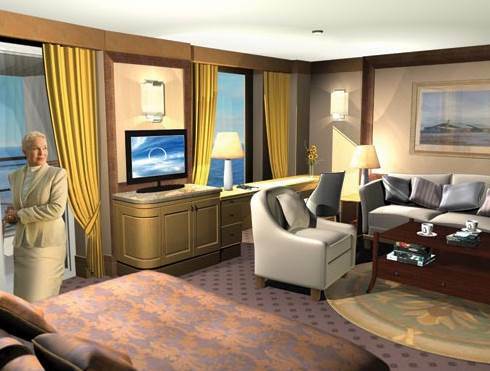 31 price grades and just 8 accommodation types are available onboard Cunard CV. 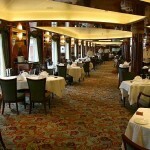 These include eight Princess Grill, seven Queens Grill, twenty Britannia grades. 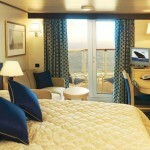 Aft are located the four Grand Suites, with great ocean views and walk-around private balconies. 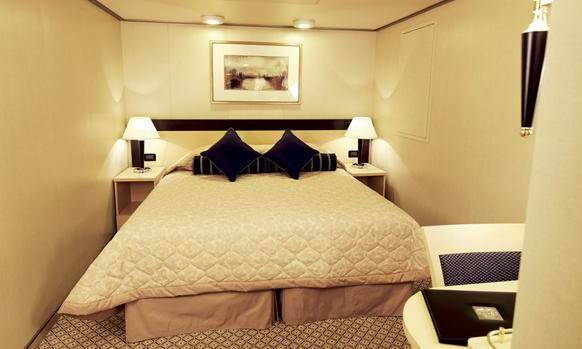 Other choices include: Master Suites (2), Penthouse Suites (25), Queens Suites (35), Princess Suites (61), no-view Interior Cabins (143), outside-view Cabins (146) and Balcony Cabins (581). Grades C/D regular cabins are small and functional. Grills Experience, high on Deck 11, reaches pinnacle between 7-9 p.m. each evening in the Courtyard and the sublime Queens Grill. Enjoy Grills Terraces and pre-dinner cocktails in Grills Lounge. Luxuriate in your own haven of 2131 sq.feet, featuring whirlpool baths and marble bathrooms. The expansive private balconies command impressive sea views – sip your champagne or curl up with a book on offer. Refrigerators are all stocked to guests’ preferences. Concierges and butlers gladly attend to every caprice. After your pre-dinner tipple in Grills Lounge, join the main event in intimate Princess Grill, or try al fresco in Courtyard when the weather is warmer. Catch the evening sea breeze on the exclusively reserved grill terraces. Relax in the soft robe on your private balcon. 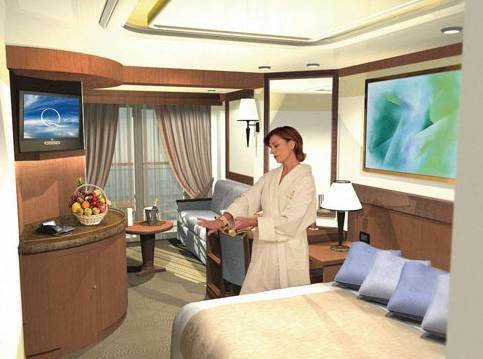 The lavish Princess suite is up to 513 sq.feet, with personalized stationery, Bon Voyage wine, concierge service and fresh fruit. 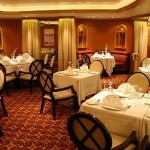 Each evening in the stylish Britannia Restaurant promises enticing menu and fine wines. 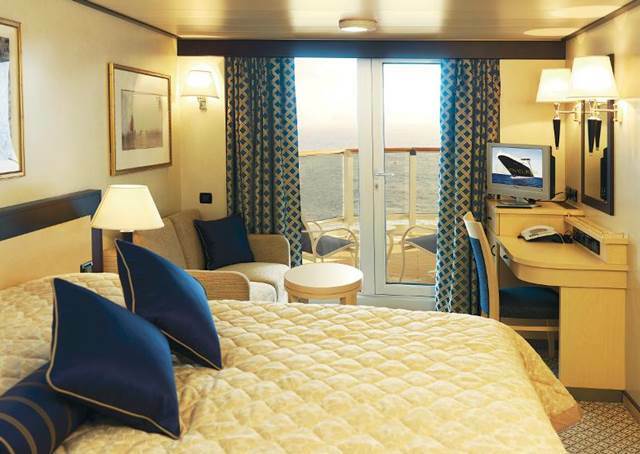 Your stateroom will give you up to 472 sq.feet to unwind. Put on your soft bathrobe, ease into the slippers and settle down to your TV. The turndown service sets tone for comfortable sleep. The hallmark of cuisines in QV main restaurants is the inventive variety. 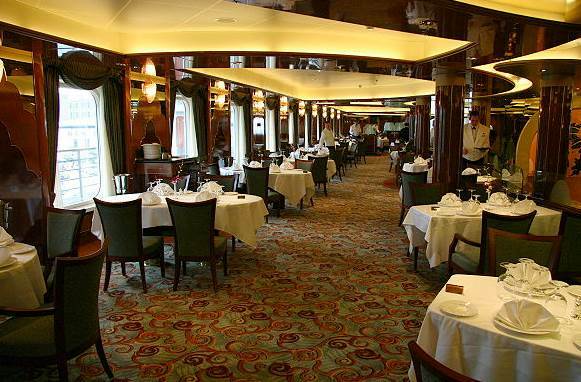 Culinary adventures aboard Cunard Queen Victoria extend beyond the elegant menus. 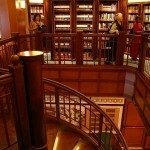 Feel free to act on your tastes’ impulses and seek for options that range from superbly casual to sublimely creative. 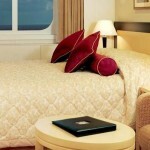 Remember that Cunard room service is available at any time on call from your stateroom or suite. Choice and excellence are always combined on Queen Victoria. 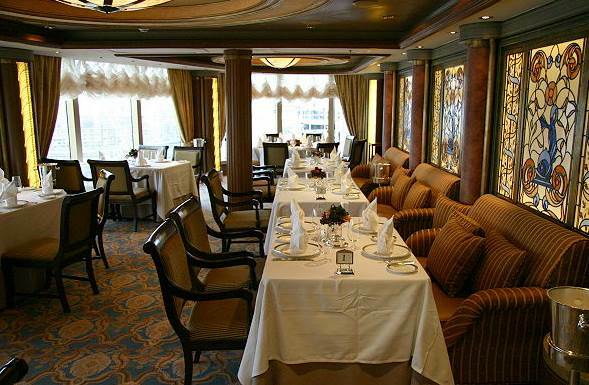 Queen Victoria is classless ship but in fact her passengers are divided according to CV restaurant that they dine in, linked to the price of cabin. 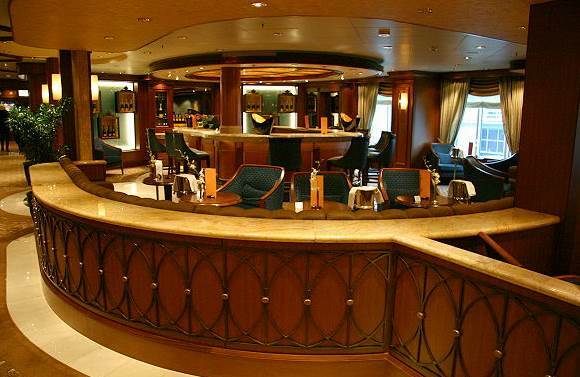 Britannia, which features 900 seats, is regular cabins’ standard. 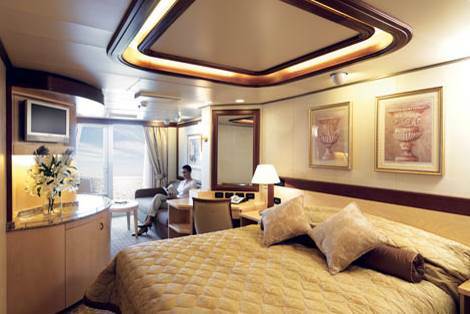 The 130-seat Princess Grill is ‘middle class’ for guests who occupy junior suites. 120-seat Queen’s Grill is ‘superior class’ for suite deluxe passengers. 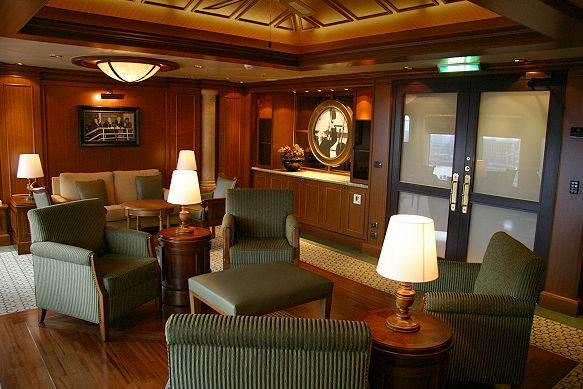 The rest of the public rooms onboard are all used by guests on equal basis. Queen’s and Princess Grill offer attached lounges and open courtyard. For guests who stay in Queens Grill accommodation, this is ultimate expression of dining excellence. The waiter will guide you through delicious possibilities. The chef does his best to fulfill all requests. 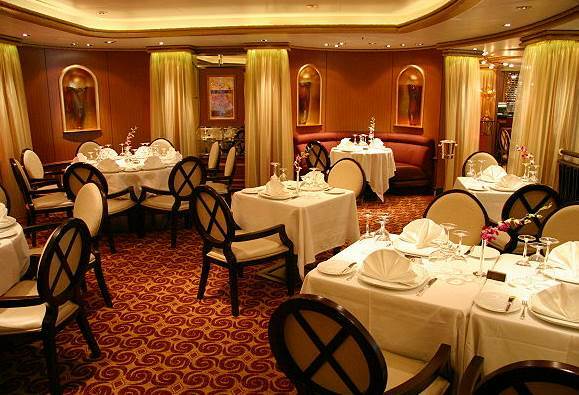 Intimate Princess Grill restaurant is located on Deck 11. After their pre-dinner tipple in Grills Lounge, guests in P-category prepare for the main evening event. The delicate flavours and ingredients are superbly combined on imaginative menu a-la-carte, complemented by fine wines. 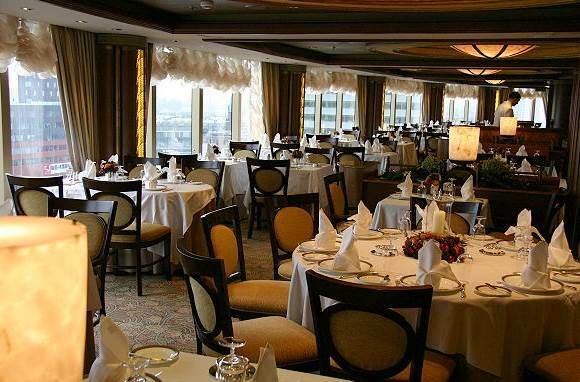 The two-tiered (Deck 2 and 3) magnificent Britannia Restaurant is where you’ll delight splendid nights after being in the comfort of Britannia Staterooms. Choose early or late dining – your table awaits. Britannia attentive service is unobtrusive. Creative artworks provide eye-catching centerpiece. Todd English Restaurant requires reservations for its intense flavours from the Mediterranean. Each of the served courses continues the gorgeous travel to this rich in culinary flair region. Lido restaurant offers more casual, airy and bright environment by day and night. 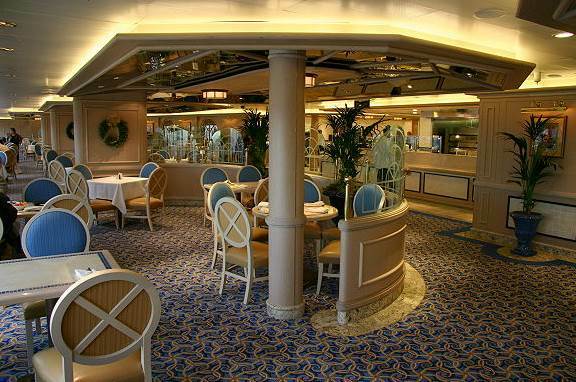 It’s 450-seating and provides the perfect settings for a relaxed dining experience. 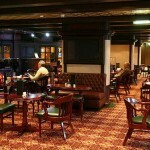 Golden Lion offers impressive selection of cider and beer. 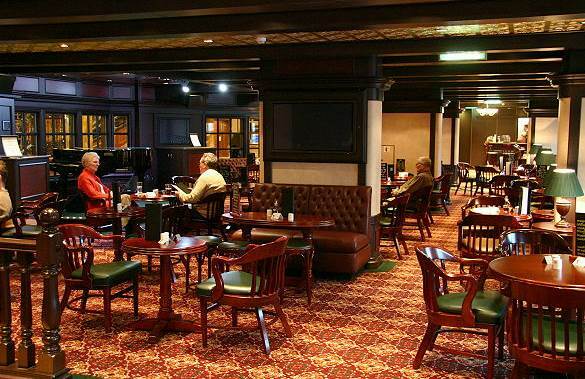 Once you’ve sharpened your appetite, satisfy it in these traditional and cosy surroundings from the gastro pub menu. The Courtyard is Grill guests’ exclusively reserved area where passengers may dine and sip their afternoon tea. 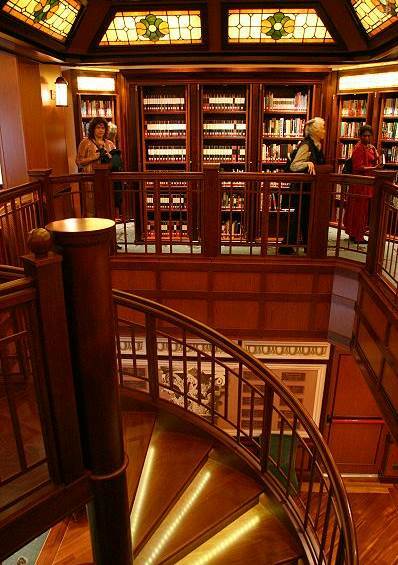 Queen Victoria features grand public rooms, each dedicated to guests’ pleasure and relaxation. 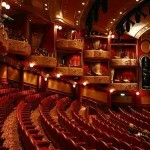 Royal Court Theatre is three-level grand and refined West-End-style amenity. 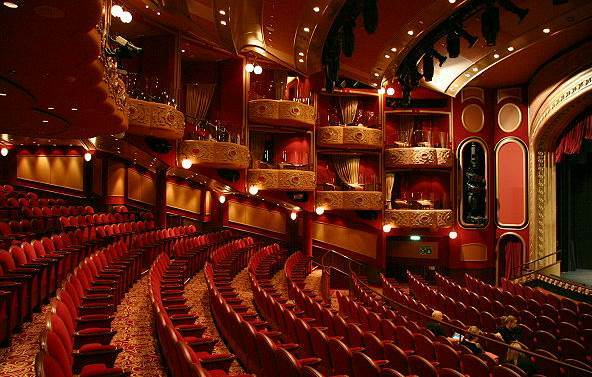 This is the first at sea Theatre with Private boxes which bring unobstructed views of the stunning entertaining productions. Chart Room is next to the Britannia Restaurant, perfect for an elegant pre-dinner cocktail while relaxing amongst this nautically themed bar and lounge. 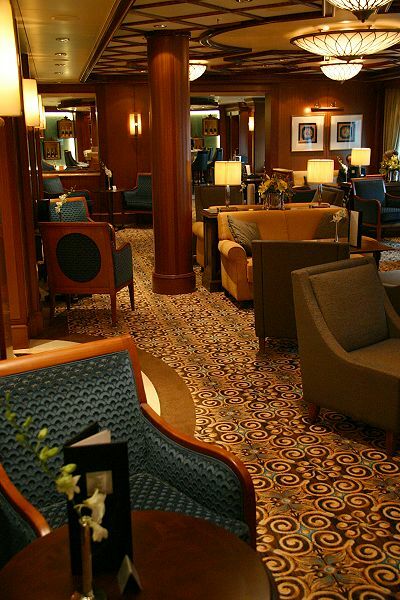 Churchill’s Cigar Lounge, the place to settle into an armchair after dinner and savour Cunard’s rich worldwide selection. 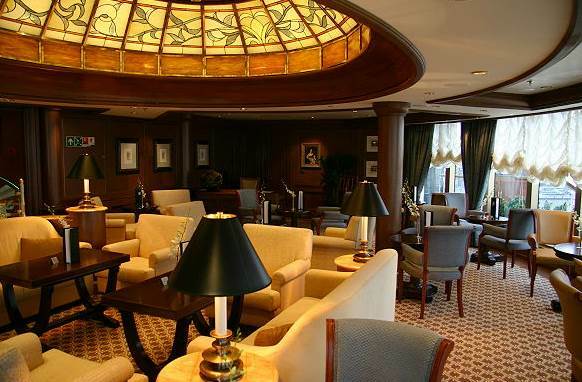 Commodore Club occupies the Deck 10 forward position, where the memories of Cunard Line’s past contrast magnificent panoramic views over bow into the future. Hemispheres is a stunning contemporary nightclub where you can swing into the band’s rhythm under the terrific glass-domed roof. Sip exotic cocktails while the band swings. The illuminated Pavillion pool below gives off fantastic turquoise glow. 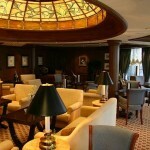 Midships Lounge is where wine connoisseurs explore regional subtleties and compare grape varieties. And Queens Room is where waiters orchestrate white gloved afternoon tea serving. The Royal Health Club and Spa features a large gymnasium equipped with high-tech fitments and offering magnificent ocean views. There is also an aerobics area, extra-cost Thermal Area (sauna and four kinds of steam rooms – a day pass is between $35-$300 for 1-20-days passes), body treatment rooms and rasul chamber for mud and steam private Hammam-style bathing. Also available are a beauty salon and relaxation area. 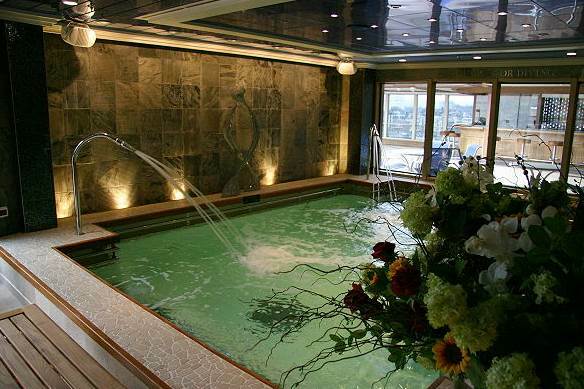 Queen Victoria Royal Spa is situated forward on Deck 9. The gym is not the largest at sea, but offers a good equipment range both for resistance and cardiovascular training. Its staff runs pilates classes, salsa aerobics and indoor cycling for a fee. 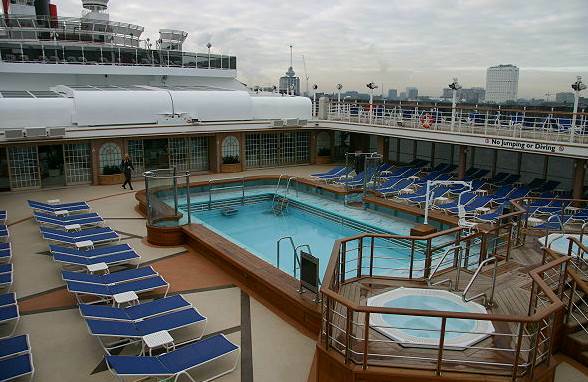 The QV ship offers two swimming pools – aft Lido pool and amidships Pavilion Pool, both on Deck 9. Only the Lido is of normal depth. To each pool there are also two Jacuzzis adjacent. The Winter Garden is located amidship, adjacent to the pool area. It is the table tennis and art auctions spot. 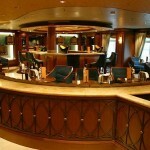 It also has a bar serving coffee, smoothies and fresh-squeezed drinks, along with the traditional cocktails. 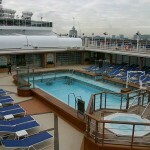 Passengers in Grills accommodations can enjoy their own sun deck, delivering them from the position of trying to find place on pool decks below. An elegant outdoor spot is the Courtyard, also Grill-only option with al fresco dining when the weather allows. 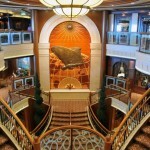 Deck 3 – the promenade deck unfortunately doesn’t run around the ship – its forward part is crew only. All guests can do is U-shaped walks. No jogging track is available, but for those who love the fresh sea air, the reclining seats may seem very pleasant. 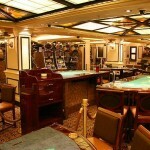 For sports enthusiasts, on Deck 11 QV ship provides outdoor games, such as paddle tennis and shuffle board. You can also practice golf. As Queen Victoria’s husband Prince Albert loved fencing, QV ship features such classes in the Queens Room. Fencing has been offered for the first time on a modern liner. 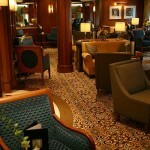 Cunard QV dress code tends to be elegantly formal. 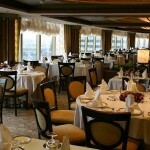 Speciality restaurants and main dining rooms are where guests can dress up to impress each evening. The first and last cruise nights are “elegant casual” (wearing a jacket, no tie). Up to three days at sea each week are formal (black suit or black tie). Port days and the rest of sea days are semi-formal (wearing jacket and tie). 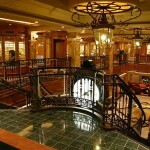 Practically everyone of Cunard guests observes formal nights’ dress code. 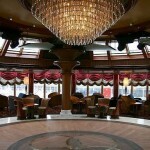 Queen Victoria is an elegant cruise vessel and looking at one’s best is definitively part of the experience. 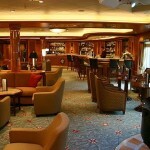 Britannia passengers are charged $11 per day per person and Princess and Queens Grill guests – $13 per day per person. 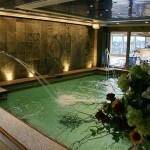 15% tip is added to wine and bar, and health spa treatment and salon fares. 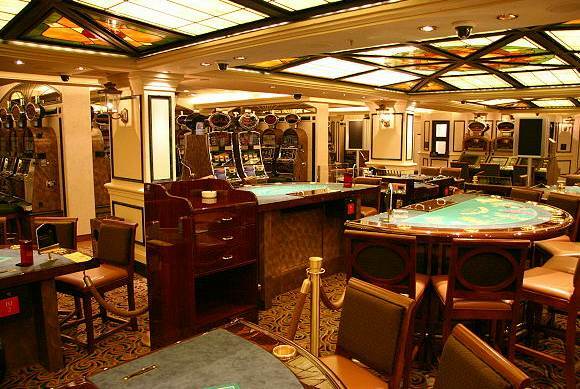 All gratuities are charged automatically to travelers’ onboard accounts. Cunard Queen Victoria clientele features mostly beautiful and successfully rich people who simply adore the Cunard Line’s ambiance of style and sophistication, top-class hotel amenities, large and charmingly furnished accommodations, high-class society dining and entertainment options, and of course, the highly attentive, absolutely superb “Cunard White Star” service. 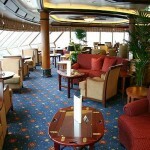 Onboard Queen Victoria, there are mainly well-traveled, well-to-do passengers in their 50’s or up. However, QV attracts also a great deal of first-timers. 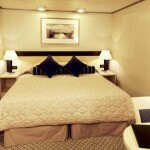 The QV ship caters primarily to couples, but you’ll also feel welcome when you come on your own. The geographical coverage varies greatly as the duration of the cruises – from 4-night mini-cruises to circumnavigations, so too will guests’ mix. 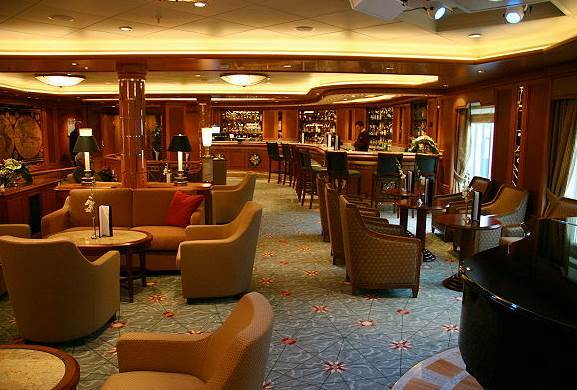 Cunard Queen Victoria cruise ship is an excellent choice to explore some of the world’s best ship vacation spots traveling on this big and inexpensive luxury cruise liner. Get your well-deserved share of the Cunard Queen Victoria experience – only the best from this unique company, all the time. It is an authentic “rich to richest” deal – stylish luxury, concierge service, sun, ocean, special – you and your memorable cruise on Queen Victoria, by Cunard!